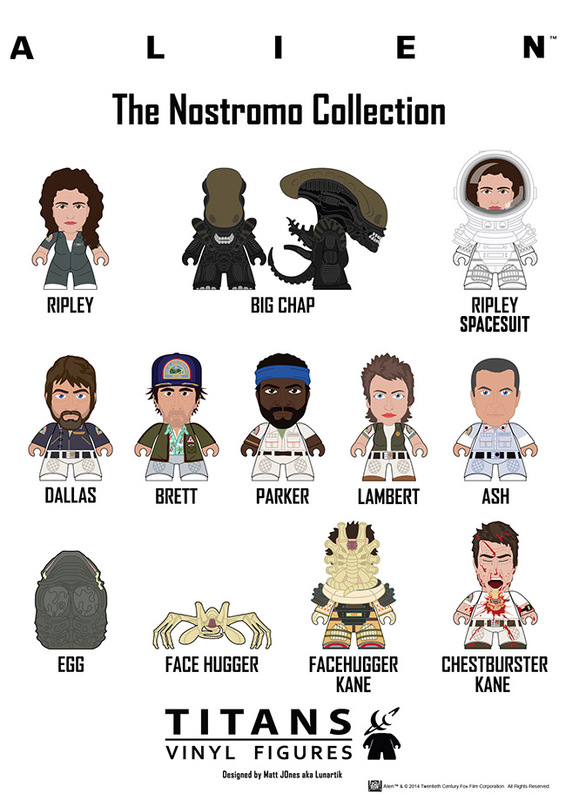 Titan Merch announces Alien TITANS: The Nostromo Collection! June 20, 2014 -- We are very pleased to announce Alien TITANS: The Nostromo Collection, the latest in our vinyl figure range! From 20th Century Fox and Titan Merchandise comes Alien TITANS: The Nostromo Collection! The entire crew of the USCSS Nostromo are featured in this 12 piece set – including their stowaway, the infamous Xenomorph (nicknamed "Big Chap"). From the secretive Science Officer Ash, to the ill-fated Kane, to the heroic Warrant Officer Ellen Ripley, every member of the doomed star-freighter is featured in 3" Blind-Boxed format. Also featured – in every stage of its evolutionary cycle- is the eponymous creature: Egg, Facehugger, Chestburster and adult Alien are all represented in vinyl form! 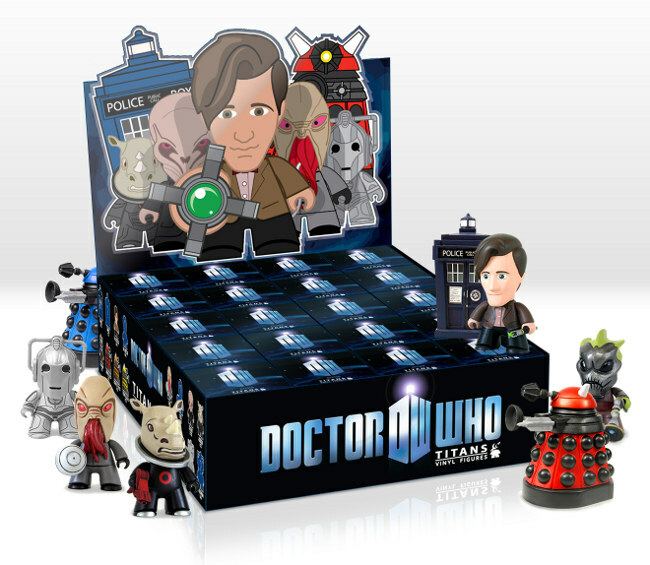 December 2012 - Titan Merchandise is proud to announce our first wave of Doctor Who Titans vinyl figures, arriving in stores this December. Celebrate the intrepid Time Lord with this unique collaboration between BBC Worldwide and Titan Merchandise, featuring a 'multiverse' of figures to collect! Curated by world-renowned vinyl designer Lunartik, this 16-character adult collectable set (including four super-rare "chase" figures) is based on the global hit TV show Doctor Who and includes stylised interpretations of Matt Smith's Eleventh Doctor, his amazing time-and-spacecraft, the TARDIS and some of his most notorious foes - including the supremely evil Daleks and the inhuman Cybermen. Each vinyl figure is 3" tall and several designs come with character-specific accessories. All figures are blind-boxed, adding to the mystery and excitement of hunting down all 16 designs. November 2012 - Titan Merchandise and BBC America are holding a poll for fans to vote on their favorite Doctor Who t-shirt designs. Ten lucky poll-takers will win a free t-shirt! The poll closes on December 21, 2012, so you have a little bit of time to mull over your votes. 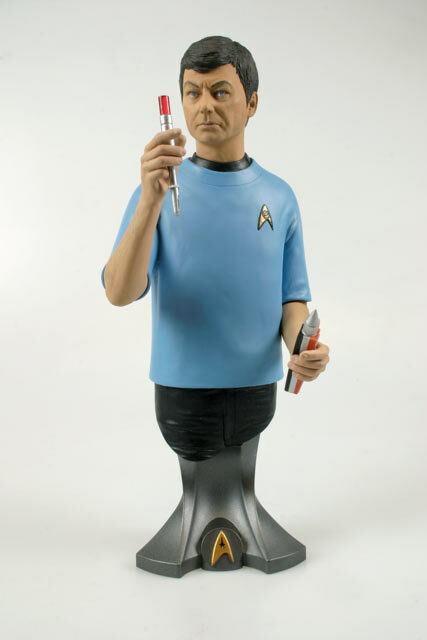 February 23, 2012 - Titan Merchandise are proud to announce our latest range of limited edition, officially-licensed, high-quality statuary: the Star Trek Masterpiece Collection! Continuing our ongoing range of Star Trek figurines, this beautifully-crafted maxi-bust presents Star Trek legend DeForest Kelley in his unforgettable role as Dr. Leonard "Bones" McCoy. Every detail and nuance of McCoy's dedicated & compassionate approach to 23rd century medicine is captured in this astonishingly-detailed polystone bust, standing 8" tall and 5" wide. 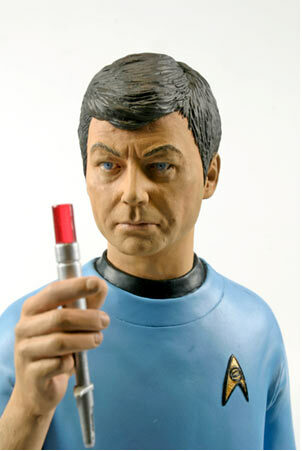 The Dr. Leonard "Bones" McCoy Maxi-Bust celebrates fan favourite DeForest Kelley's unforgettable performance as Star Trek The Original Series' passionate, occasionally cantankerous chief medical officer.